Located in the summer constellation of Cygnus, the North American Nebula (NGC 7000 at the middle left of this image) and the Pelican Nebula (IC 5070 on the right) form a complex of hydrogen emission nebulae located just a few degrees east of the first magnitude star Deneb. Filling over 10 square degrees of sky, the complex shines from the hot hydrogen gas that is energized by the new stars formed in the region. For this reason, the nebulae respond well photographically to a narrow band Ha filter. This image combines my Hydrogen Alpha data with my RGB Color data to form an HaRGB version of this beautiful region. Software Used Images Plus 5.5 for camera control, calibration, stacking, digital development, smoothing and noise reduction, star size and halo reduction, and multiresolution sharpening. Photoshop CS5 used for levels and curves, high pass filter, star shrinking, screen mask invert, lab color, selective color, hue adjustments, and unsharp mask. Gradient Xterminator for gradient removal. Registar for registration and stack alignment. Carboni Tools for additional noise reduction and smoothing. Focus magic for focus restoration. Notes This is the third HaRGB combination image I've taken, and this one features a total of over 41 hours of data collection. I'm still trying to perfect my technique for combining Ha and RGB, and I'm learning to control it better. In this version, I was very happy that I was able to add the Ha data as a luminosity layer, and was able to push the opacity of that layer up to 90%. While the image has a bit of the salmon color that can result from this type of combination, I don't feel its overly objectionable and it yielded some very nice details - particularly in NGC 7000's Cygnus Wall as well as the Pelican Nebula's IC 5067. This image was chosen to be Nasa's Astronomy Picture of the Day for September 3, 2013. This is my second Nasa APOD! 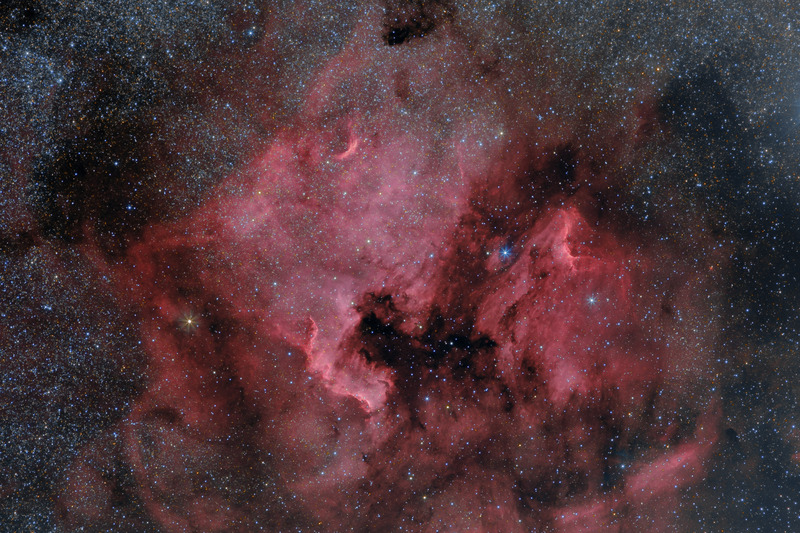 This image also won first place in Astrophotogallery.org's Medium-Nebula category for August 2013.